16 entrepreneurs were given the platform to realise their ambitions by exhibiting and pitching for significant investment to develop their innovative ideas and push them out to a wider market. The merging of the pioneering medical and tech industries has created a wealth of opportunities, which is something the inaugural Med Tech Investment Showcase explored earlier this month in London. 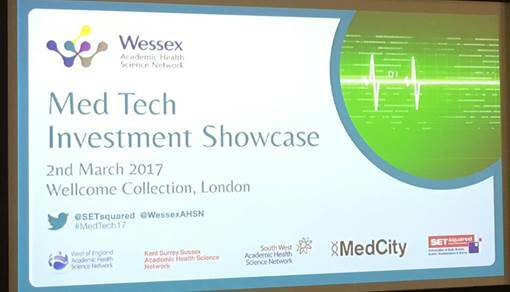 The event was organised by Wessex AHSN and global leading university incubator SETsquared, with support from West of England, South West, and Kent Surrey Sussex AHSNs. Healthcare innovators have the power to improve and save lives by developing products such as prosthetic limbs and wearables for conditions such as respiratory attacks and hip fractures. Taking these innovations to the next level by securing funding is a fundamental requirement for success. And the aim was to help entrepreneurs change lives for the better by holding this showcase event. The ingenuity of these innovators means there is now a range of products and designs that will positively impact on an individual’s quality of life – and in some cases could even save them. The businesses pitched to 100 angel, venture capital and corporate investors at the showcase led by Wessex AHSN, . Nicola Blackwood, Minister for Public Health and Innovation said: “It’s fantastic to see Wessex AHSN and others playing such a proactive role in identifying and supporting the type of innovations that can deliver tangible improvements in productivity and patient outcomes. The investors were specifically looking for products and services that can save the NHS money while also offering a broad commercial appeal – with excellent prospects to make a financial return.